The Badlands Amphitheatre is a non-profit, 2,500-seat outdoor theatre, music and event venue located on 300 acres in Drumheller, Alberta, in the heart of the Canadian Badlands. 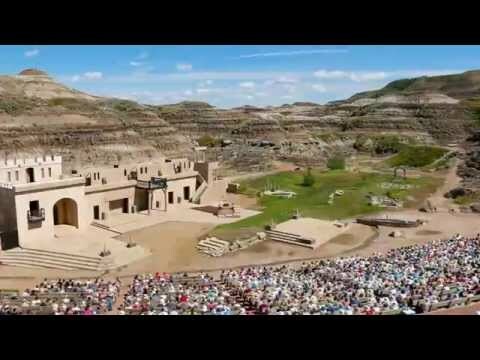 Known as Canada's largest outdoor stage, the amphitheatre is a spectacular natural venue that attracts and inspires Canadians and visitors to Canada alike, and has hosted the Badlands Passion Play for the past 25 years. Its mission is to promote the arts, create events, encourage tourism, and build community by creating significant cultural attractions. Major events include outdoor opera, Blues & BBQ in the Badlands, classical concerts, the Canadian Icons concert series, outdoor sound and light shows, and the Badlands Passion Play. "This performance was world class and rivaled the theatre that I had seen earlier in my trip on Broadway. Stunningly executed by a director who clearly knew how to constantly surprise and engage through spectacle, music, site specific staging, movement and dialogue." "The production is excellent and the backdrop brings the play alive. We were in Germany 5 years ago for their Passion Play. We found this to be superior as the setting is so perfect!" "Excellent story and production! The cast and the setting is very very impressive. The location is very accessible and operation is very impressive." "It’s a powerful story told with compassion, insight, integrity and love and it unfolds in a breathtaking natural amphitheatre on the outskirts of Drumheller. It all seems so real and so immediate, which makes this story of the ministry,death and resurrection of Christ eminently compelling.”"
"We LOVED the performance...everything about it was spectacular, awesome (in the true sense of the word), amazing and powerful. A thousand thank you's to all." "We really, genuinely enjoyed it. I will sum up the whole experience in two words ''Simply Amazing''. "